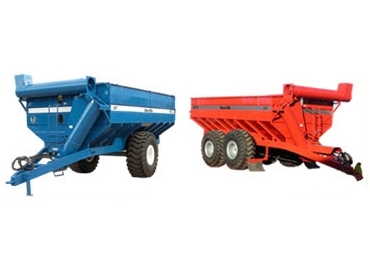 Trufab Farm Machinery supplies a wide range of chaser bins that are available in 18, 25, 30, 40 and 45 tonnes capacities. All chaser bins from Trufab Farm Machinery are fitted with hydraulic brakes that are operated from the foot pedal or hydraulic remote lever. They also feature earthmoving tyres to cope with the weights handled, except Steerable Tri-axles which have flotation tyres. As standard, 18 tonne chaser bins are fitted with a hydraulically driven sweep auger which force feeds a PTO driven 14.5” (370mm) discharge auger. This discharge auger is able to discharge at 5.5t/min. Also, 25, 30, 40 and 45 tonner chaser bins are supplied with a hydraulically driven sweep auger which force feeds a PTO driven 18” (457mm) discharge auger as standard. This discharge auger can discharge at a rate of 11-12t/min. All bin augers have a hydraulic folding and over centre locking function in unloading position, meaning there is no need for bolting. Hydraulically driven discharge augers are available as an optional extra. All Trufab chaser bins come with roll tarp and external joints are sealed before painting to avoid corrosion.